The Historical Society of the Memramcook Valley was created on January 27, 1977. 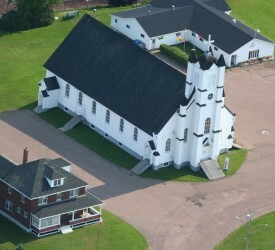 Established in order to safeguard the Lefebvre Monument, the Society’s purpose is to promote the rich heritage of Memramcook – the “Cradle of Acadie” – and assist in its development. The Historical Society manages the museum, organizes public activities, publishes historical books, and maintains a document and archive center on the history of the region. We extract articles about Memramcook from the journal L’Évangeline. Works already published: 1956-1960. The next (1961) will be available in November or December. The Historical Society of Memramcook Valley invites you to visit this beautiful region, rich in Acadian history. Get to know our heritage through our museum, our photo exhibitions and other thematic exhibitions during the summer season relating to the daily life of the Acadians in the region.